Leasing Available from $33.04 per month! 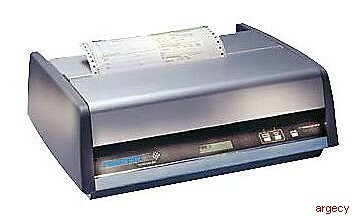 The PrintMaster 860 Series printer is a narrow format dot matrix printer expressly designed for heavy workloads. Flexible paper feeding from the rear or bottom makes the printer ideal for applications where space is at a premium. The PrintMaster 860 Series has a fast draft of 530 cps and regular draft speed of 400 cps with a paper slew rate up to 12 ips that provides exceptional throughput. All forms automatically position for easy tear-off, saving time, money and material on all print jobs. Print jobs can be easily recovered in the event of a fault condition with the page reprint feature. Paper is automatically loaded from another tractor if a paper out condition occurs. This feature is only available in PrintMaster 862. A rear-feed single tractor is standard. The PrintMaster 862 has a bottom-feed tractor, giving you added printing options. A metal pedestal is also available from Printek for effective use of both tractors. Flexible Connectivity Serial and parallel ports, along with popular emulations and bar codes, are all standard. An optional internal Ethernet interface with unique forms management features is available, as well as interfaces for legacy systems. Easy Setup Printer configurations can be selected directly through the front panel, remotely through our Remote Printer Setup Software package, or through an optional plug-in module. Parameters for up to 10 form profiles can be stored and recalled at any time. Options and accessories that are available for the PrintMaster 860 Series include: internal Ethernet for network forms printing, a metal pedestal for optimizing the use of both tractors when printing, and a setup module for easy configuration of multiple printers. The 862's Dual-Trak paper handling system allows two forms to be loaded at all times. Printhead 18 wire parallel array. Printhead Adjustment Automatic gap adjustment is standard. Draft, Draft and Letter Quality for Epson and IBM Proprinter. Optical Quality for OCR-A and OCR-B. 5, 6, 6.7, 7.5, 8.4, 8.6, 10, 12, 13.3, 15, 16.7, 17.1 and 20 cpi. 85 characters at 10 cpi. Also software programmable. Line Spacing 6 and 8 lpi. Zero tear-off distance; paper out/paper jam detection; fanfold, continuous forms, edge punched. Automatically loads paper from another tractor if paper out condition occurs. (Model 862 only). Normal Operating Mode: Online, Form Feed/Load and Form Select/Unload. Non-volatile memory for ten forms, each supporting settings for: tractor path, cpi, lpi, form length, left and right margins, top and bottom margins, unidirectional printing, slashed or non-slashed zero, language, font, high-impact on/off, form name. LED indicates Online/Fault/Setup; 2 x 16 LCD for form selection; on/off line status and error descriptions. Ribbon Cartridge: nylon fabric, mobius loop, approximately 15 million characters. Power Consumption: 18W non-printing, 60W printing. Model 860: 6 ips rear feed. Model 862: Up to 12 ips bottom feed. Paper Width 2.5 to 9.75 (6.4 cm to 24.8 cm). Model 862: Rear feed and straight-through bottom feed. 1 to 9 parts; 0.025- max. thickness. 60 to 240 dpi horizontally x 72 dpi vertically. Control panel, pluggable cloning module or remote via Windows program. Parallel: Centronics compatible. Serial: RS232, 300 to 19,200 baud. Emulation choice of Printek, Epson FX, IBM Proprinter, DEC LA120/210, Genicom ANSI (includes 20 popular bar codes) or Basic Bar Codes (includes Code 39, 2 of 5, Interleaved 2 of 5). Second tractor on Model 862 adds 3.5 (8.9 cm) to height. Second tractor on Model 862 adds 10 lbs. (5.3 kg) to the weight. Reliability 10,000 hours on electronics, with 100% duty cycle. Printhead Life: 500 million characters. Warranty: One-year printer warranty, two-year limited printhead warranty when Printek brand ribbons are used; one year warranty when non-Printek brand ribbons are used.